The Library is making it easier to study archives at UVA and other institutions by providing access to images that had once been viewable only with locally built applications. UVA’s participation in the International Image Interoperability Framework (IIIF) means that scholars at UVA can now more fully compare editions of books and maps, study differences in artistic style, and analyze the complete manuscripts and correspondence of writers, statesmen, philosophers, and theologians—getting closer to collections that had been essentially locked away. The goal of IIIF (pronounced “Triple-Eye-Eff”) is to develop a common set of APIs that work together, allowing scholars to virtually hold versions of the same document from different archives side by side for minute comparison. Imagine the potential for discovery in being able to simultaneously view printings of books at UVA with other printings at different institutions, or the insights scholars might derive by having access to letters that fill gaps in Jefferson’s correspondence. 1. Find an image in Virgo from the Library’s digital collection—a 1755 version of Joshua Fry’s and Peter Jefferson’s A Map of the Most Inhabited Part of Virginia, for example. Click the IIIF icon to open the image in Mirador. 2. To compare the 1755 with the 1753 version of the same map, click the grid icon in Mirador to create another viewing slot. 3. 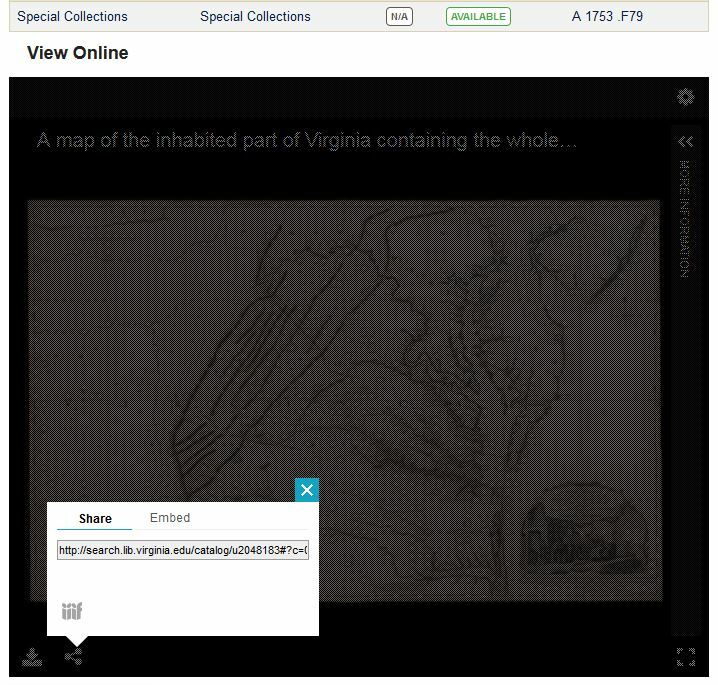 Open the 1753 version in another browser window, click the “share” icon under the image, then click the IIIF icon and drag the image to the Mirador viewer. But Mirador isn’t limited to a collections at UVA. 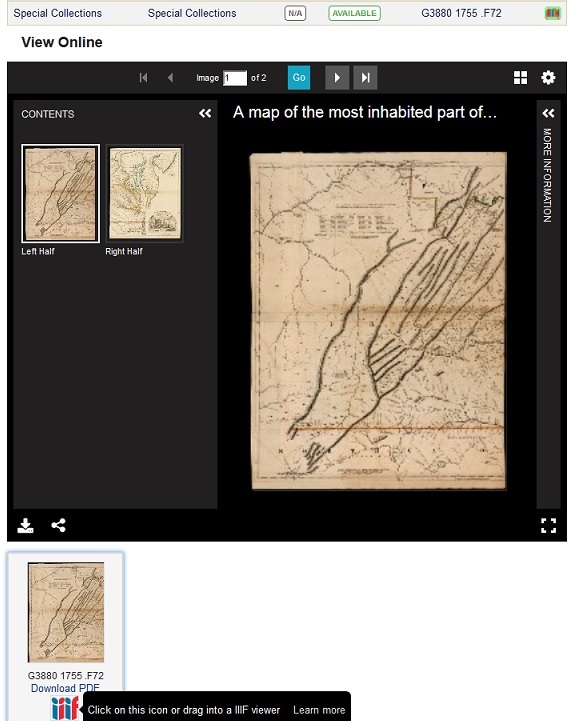 From Stanford’s catalog you can use the same drag-and-drop process to pull a similar map into Mirador and compare it to the Fry-Jefferson map in UVA’s Special Collections. The interoperable standards developed by the IIIF community, of which Stanford and UVA are a part, means there is no proprietary wall to breach. This entry was posted in Featured Resource, News and tagged books, digital accessibility, Digital Production Team, IIIF, library resource, manuscripts, maps, Mirador, new online resource, research, special collections, Teaching & Learning, technology, Virgo by Mitch Farish. Bookmark the permalink.